See SALE page for details. Copyright Ellen H.Rice, Ocean View, Delaware, 2001. All rights reserved. A limited number of archival gicle'e prints from the original 48" x 36" painting by Ellen Rice are available. TRUTH IS THE MOST PRECIOUS COMMODITY IN ALL EXISTENCE. Without it, we have no foundation on which to build. With it, we have the basis for everything good. 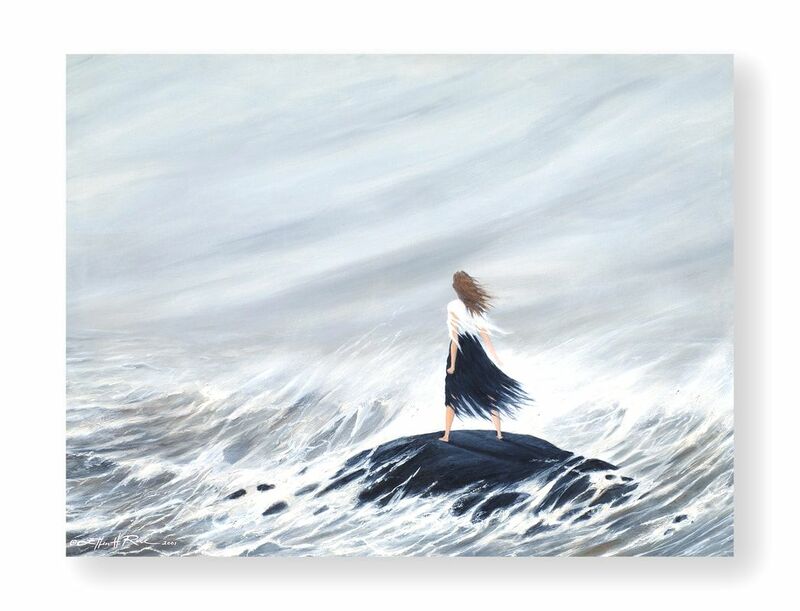 Standing on the Rock is the first of a series of paintings about “The Strength of Woman.” The painting depicts a woman facing into a fierce storm. The winds rage around her. Her hair whips behind her. Her clothes blow in tatters. Her bare feet are braced on a large, wet rock. Waves crash against it beneath her. The rock is in the middle of the ocean. 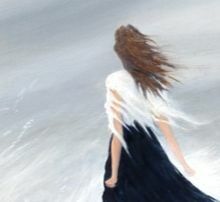 But she stands strong, head lifted up, face turned into the wind, facing whatever comes her way, for she is standing on the rock — the Rock of Truth, God. The painting came to me as a moving vision in a time when I faced what appeared to be insurmountable life storms in every direction. My husband who I had left after 28 years of marriage had told me I was going to die and that he was close to finding where I was, my only child was out there on crack cocaine, my mother had been diagnosed with alcohol induced dementia, my grandmother was in a nursing home four hours away and needed my help, my brother was dying of cancer on the other side of the country, my rent was due and I had $4 in the bank. I didn't know anyone I could turn to for help. There wasn’t anywhere I could turn my thought and find peace. After repeated attempts to personally resolve what as a reasonably intelligent person I thought I could do, I was brought to realize that I couldn’t solve any of it. It was only when I let go and gave all the problems totally, completely, unconditionally over to God that the storms began to subside one by one in almost unbelievable ways and I found of peace. The night the vision appeared, it finally dawned on me that in all periods of my life, even the worst, God, whose very essence is described in the Bible as Love, had not only never abandoned me as I had thought, he was with me, within me, undergirding me, always. He wouldn’t let me fall. He never has. But I hadn’t learned to recognize his “voice,” that “still small voice” described in the Bible — those “gut feelings” inside that we all have and either heed or don’t heed often to our sorrow. Events throughout my life reeled before me and I realized every instinctual feeling I’d had all my life had been true. It was as if a light came on, highlighting instances of God’s guidance. My problem was I hadn’t trusted those leadings. I hadn’t known I could trust them. I hadn’t known they were from God. As Elijah discovered while fleeing persecution in the wilderness, God is not “out there” — in any destructive forces or events in life. He is within us, each and every one of us, you, me, everyone. Always. To know this truth is to be truly free. And it is strength. Sometime, take time to think about what kind of world we would have if truth, our highest perception of it, were told by everyone — if we could truly see into the hearts of our brothers and sisters on this globe. At heart, our heart of hearts, deep inside where the child created by God still lives, we are all the same, regardless of outer trappings and life experiences. We go in search of many things in life, but at the most fundamental level what we all need is the most simple, beautiful thing on earth — love. And it doesn’t cost a cent. If we could discern the truth about everyone and live out from that understanding in every situation in our lives, a new sense of oneness would be established among all people on the earth. Think about it. War would end. Crime would cease. Drugs and alcohol wouldn’t be needed. There could be no corruption. We’d come closer to achieving the Biblical promises of establishing “heaven on earth.” We’d come to the time mentioned in Isaiah when we would “learn war no more.” Is this possible? We can’t do it all at once. We can start this moment, individually, by searching our own hearts and communicating honestly. Truth isn’t something done in groups. It starts with each of us. One by one, moment by moment. It means not taking the seemingly easier route when faced with challenges. This is my challenge to everyone reading this. As much as you can, if you are not already doing so, strive to live out from your own personal truth and seek out the highest truth in every situation and every person. There is great strength in standing on truth. Women have always had to be strong. In this age, we need to be stronger. We have done more than just trade challenges of the past with those of the present — we’ve kept most of the old challenges and taken on many more. The strength we need can’t be gained from acquiring wealth, success, possessions, jewelry, awards, climbing the corporate ladder, getting your child in Yale, having the perfect home, sailboat and car or finding the “right” man who will provide all of the above if you can’t or don’t know how. True strength — and peace, the kingdom of heaven itself — is only found within. The understanding gained from searching your own heart and relying on your highest sense of right is a wellspring of life, an undying fountain of true riches and healing. It’s much better than the broiling sea. It is the strength of woman. This painting is dedicated to all those who have found themselves on the rock. Stand strong.